Well, we finally made it to the last day of January. It has been a long kind of sad month. I hope the rest of the year goes better than it has started off. On a happier note, this is an image of the Sea Oats Grass I was growing in a pot this year. I couldn't decide where to plant it permanently. I am going to make a new mostly native plants area by our driveway now that the road construction is done and put it there. 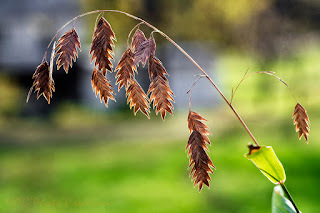 I just love it's bowed stems and the seed heads it produces. When it catches the light, it's very photogenic.